Purex is teaming up with Little Tikes to make parents' lives this summer just a little bit easier. 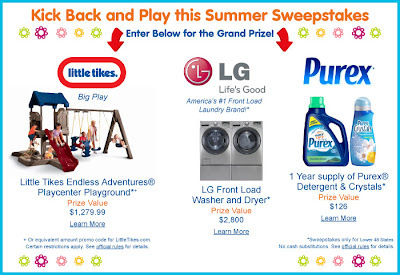 Enter to win prizes including a playground, a washer & dryer from LG, and a year's supply of Purex! See giveaway site for rules. Think of all the fun your kids could have on the Little Tikes Playground. They could be a pirate and travel to far away places searching for buried treasure. The possibilities are endless. So enter the contest and you may win some great prizes! !